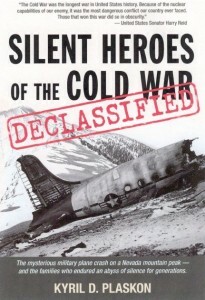 THE FULL STORY – Author Ky Plaskon goes in depth to tell the story of the1955 “top-secret” plane crash on Mt. Charleston in Southern Nevada. Gleaned from recently declassified documents and top-secret reports, Ky explores the tragic accident and the unavoidable aftermath. Silent Heroes of the Cold War Declassified contains never before seen photographs of the crash site and relates the heartfelt stories of the families whose lives changed in an instant on a cold winter morning in 1955. The book as now available!